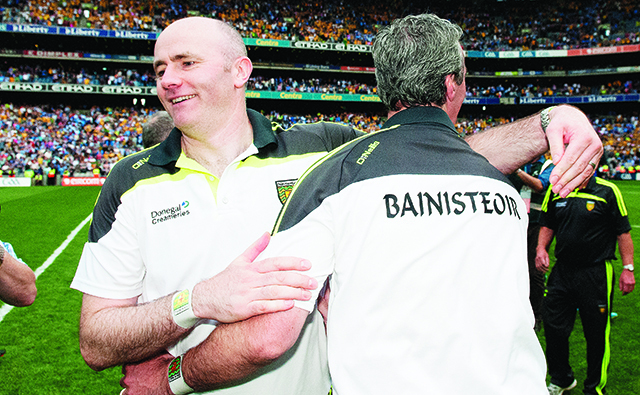 Donegal selector Paul McGonigle has put Sunday’s excellent victory over Dublin down to the serious hard work that was done in the three weeks leading up to the game and the belief within the camp that they could get through the massive test posed by the reigning All Ireland champions. Speaking to the Inishowen Independent this week the Buncrana man explained how the result was made possible. “We put in a lot of work on the training ground over the last three weeks working on ways to exploit Dublin and there was real belief within the group that we could get the result,” said a delighted McGonigle. Donegal didn’t make the best of starts in the game but McGonigle believes that when they settled after that twenty minute blitz from Dublin, they were full value for their victory. “We were delighted as a management team in the sense that our plan came right. I felt that Paul Durcan’s save in the first half was a real turning point in the game and when the boys got settled and got closer to Dublin, I thought they were superb, every last one of them,” said McGonigle. The big Buncrana man came in for some abuse from the hill on Sunday and he did admit that he thought for a split second about giving them a wee smile. “I remember when Adrian Sweeney scored against Dublin when we were playing he gave a big smile to the hill and I must admit it crossed my mind for a split second, but thankfully I thought better of it,” he laughed. McGonigle also admitted that it will be difficult for the players to come down from such a high but that they were all glad to get back training on Tuesday night. “Look the boys had a good night to themselves on Sunday and we have no problem with that, in fact we feel that it’s very important to celebrate these victories. We were glad to get back training on Tuesday night right enough as our full focus will be on Kerry now in three weeks time,” he insisted. McGonigle has said all year that Donegal had a three stage plan from when they met up last year and they are now one game away from completing all three. “When we met up last year we said that we wanted promotion, we wanted to win back our Ulster title and we wanted to win an All Ireland. We have achieved the first two and we are exactly were we wanted to be in terms of the third one,” said McGonigle. The Buncrana man insists that there is one major satisfaction he will take from Sunday’s brilliant win. “The boys turned last year completely on its head and the most satisfying thing of all is that they will now get the credit they deserve,” he said. As McGonigle was keen to point out before the game last week though, there were no medals given out on Sunday, its now all about Kerry in three weeks time. “Sunday was a great win don’t get me wrong but when people look back in 20 years time they will not be talking about the great semi final win over Dublin. It’s what we do in the final against Kerry now that really counts and it’s all we will be looking at from here on in,” said the Buncrana man.